OUR 4th EVENT ROLL-OUT OF 2016 IS: UTAH'S MIGHTY 5!!! UTAH'S MIGHTY 5 NATIONAL PARKS!!! To celebrate 20 YEARS OF MINISTRY we are adding on an entirely new adventure location! UTAH here we come!! Plan to visit "The Mighty 5" National Parks of UTAH (Zion, Bryce Canyon, Arches, Canyonlands, & Capital Reef) with GTD this year! Then check out our blogsite to see amazing pictures of everywhere we are taking you and read all the exciting details. THANK YOU 2015 DONORS FOR A RECORD BREAKING YEAR!! We are almost done mailing out our annual donation receipts to our wonderful and generous 2015 donors. We are always touched and literally blown away by anyone who would donate $1 or 1 minute of their time to support our mission. We praise God for each and every one of our contributors! Last year 107 amazing people donated $57,276.83 to this ministry. That's a NEW RECORD for unrestricted donations and the 4th highest donation total (restricted + unrestricted) we've received in 20 years of non-profit ministry! That's worthy of a big fat PRAISE JESUS and THANK YOU SO MUCH DONORS!! Our annual budget goal is around $175k each year with very modest humble salaries. We have been faithfully paying down our debt which was sustained during The 2009 Great Recession. We still have $75,000 to go until we are debt free and able to rid ourselves of this anchor that oftentimes holds us back from so much more. 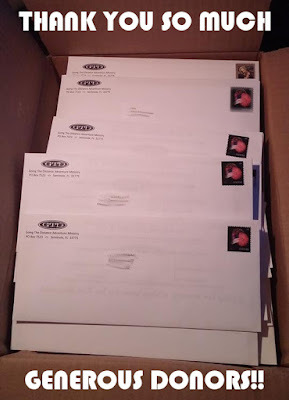 As we mail out our annual donation receipts we can't help but celebrate an incredible year full of magnificent ministry and magnanimous donors! At the same time we move forward in faithful anticipation of what God has in store for 2016 (our 20th Year Anniversary)! 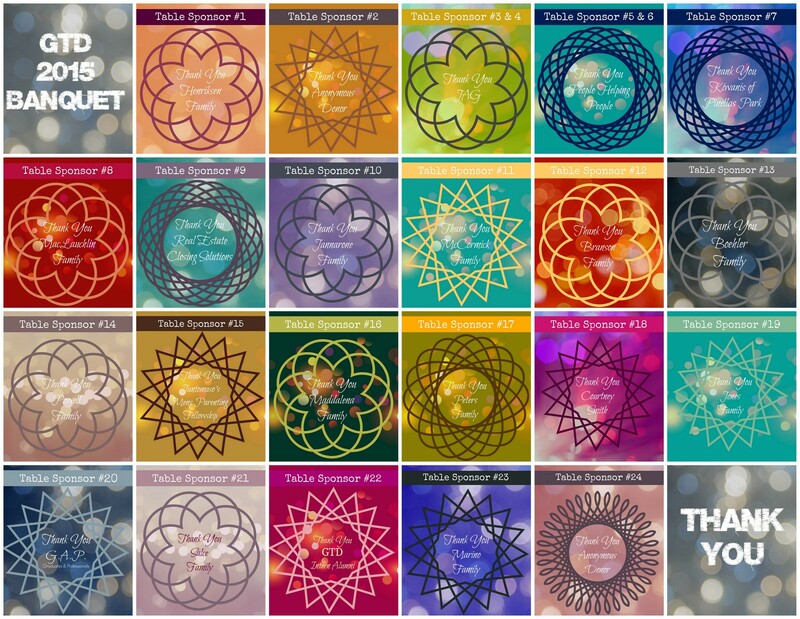 IGNITE WEEKEND RETREAT FOR ONLY $20!!! To celebrate 20 years of ministry GTD is providing one of our most popular weekend events for ONLY $20!!! That's right, ONLY $20!! That's $79 OFF our regular rate! 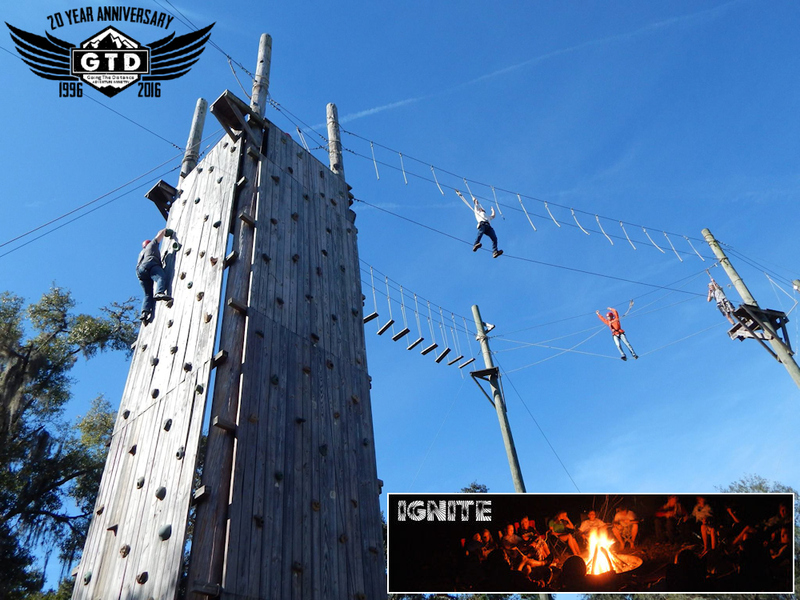 This year's IGNITE Retreat is taking place at Word of Life Camp in Hudson, FL on March 4-6. Like most GTD public trips, this is a multi-generational event for participants of all ages and has the feel of a fun family reunion. God wants to do something powerful in your life through this event. So don't let the pressures of life burn you out! Instead, get fired up by joining us on IGNITE and watch God do something "ablazing" in your life! Laurie made one of the BEST camp meals EVER over the weekend (in 30 degree temps)! Steak & chicken fajitas with onions and sweet peppers!! GTD campers eat GOOD =). Great job Laurie!!! 12 YEARS WITH FUMCO... AN ALL-WEATHER YOUTH GROUP! 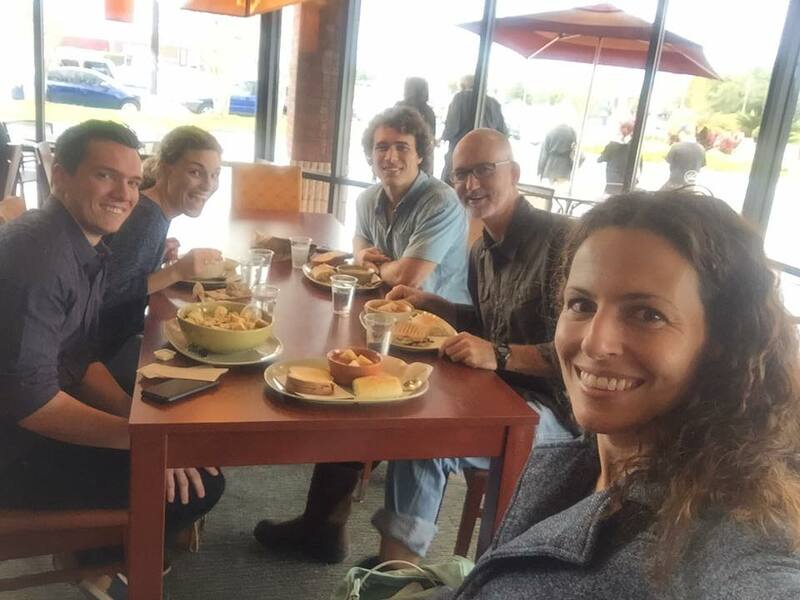 AN ALL-WEATHER MINISTRY MEETS-UP WITH AN ALL-WEATHER YOUTH GROUP! One of our longest church relationships has been with First United Methodist Church of Oviedo (aka, FUMCO). GTD has had the honor of hosting their annual youth group camping retreat for the past 12 years. We like to think of GTD as an All-Weather ministry because we will host an outdoor event rain or shine or anything in-between. 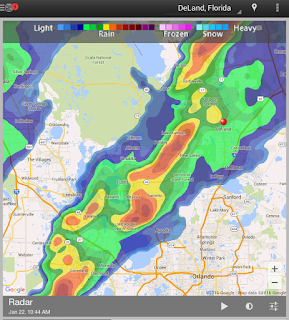 Sometimes the group would rather postpone a camping trip if adverse weather is going to affect their attendance. We will accommodate a postponement whenever we can so that the event is as successful as possible. When this past weekend's camping retreat was forecasted to be rainy, windy, and freezing we anticipated the group would probably want to reschedule the event until later this spring. But this wasn't just any group, this was FUMCO! Some of these high schoolers have been camping with GTD since they were in 7th grade. They are seasoned veterans. They didn't need to or even want to postpone the trip. They wanted whatever the weekend weather had in store. They are an All-Weather youth group! Over the course of 2 days and 2 nights we encountered rain, high winds, and sub-freezing conditions... and they loved every minute of it! It wasn't easy, but it was a whole lot of fun. They never complained or requested Uber to come drive them home. They camped out, played Russian football, ate all kinds of delicious meals, cooked smores and doughboys over the campfire, played board games, fellowshipped around the firering, doubled up on their sleeping bags, wore every layer of clothing they had, skipped showers, made pizzadillas, ate several delicious camp meals, sought God in their daily devotions, were challenged by 2 nightly Bible messages, laughed a whole lot, built memories, talked and grew closer together, and burned 2 truckloads of firewood. Laurie and I were so impressed with them. Some of the best memories we've had over the past 20 years have been when the weather conditions have been the worst. Instead of dampening attitudes it united spirits. It's another reason why camping trips are so important to family and friendship bonding. But it takes a willing spirit... just like the FUMCO crew displayed. It was a great trip and we are already talking about next year, our 13th year with FUMCO. We love this group and thank God for the wonderful blessing of our long term relationship. We look forward to what lies ahead! If you want to see the 124 pictures from our camping retreat, including me (Doug) forgetting my bag of winter clothes, Laurie laboring for 2 hours on one of the best camp meals ever cooked (fajitas! ), and the GTD Dogz sleeping in a tent then CLICK HERE. Kicking off our first camping retreat of our 20th Anniversary Year today in DeLand, FL. Thunderstorms and forecasted freezing temps lie ahead... ironically the perfect way to start our next 20 years of ministry - LOL! 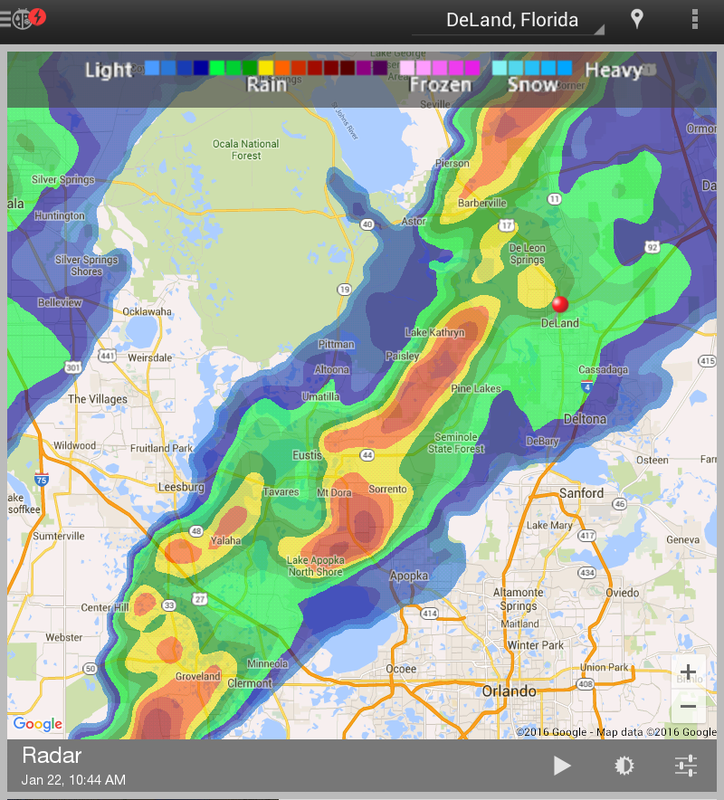 Praise Jesus, we are an ALL-WEATHER ministry fearlessly driving straight into the storm. More than a conqueror! GRAND CANYON (NORTH RIM) TRIP COMING IN OCTOBER! We have so many exciting trips lined up for our 20 Year Anniversary! Today we are rolling out the announcement of our newest version of The Grand Canyon Trip - The North Rim. We have planned out one of the most thrilling once-in-a-lifetime trips to one of the most spectacular destinations in the world at one of the best prices offered by any organizations on the planet... and GTD wants to take you there! 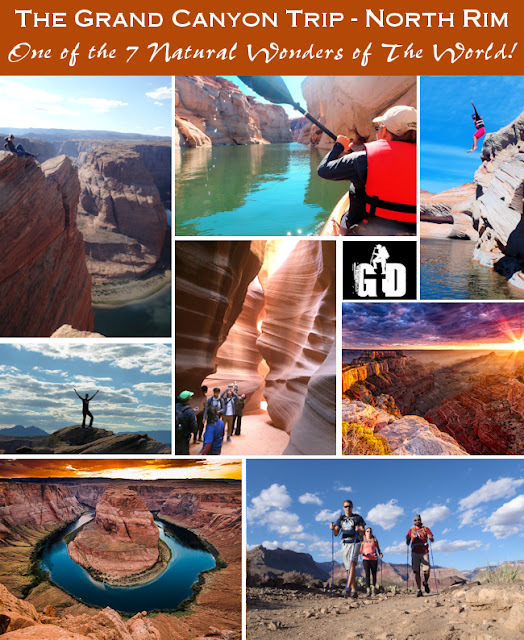 Highlights include opportunities to: kayak on breathtaking Lake Powell, tour the most photographed slot canyons in the world, canoe down a 16 mile calm section of the Colorado River surrounded by 1000 foot canyon walls, camp out one night at the base of Horseshoe Bend, tour the beautiful & remote North Rim of the Grand Canyon, hike down into the Grand Canyon's North Kaibab Trail, visit Marble & Glen Canyon, ride over the Navajo Bridge, visit Hoover and Glen Canyon Dams - 2 of the largest dams in the world, drive down the Las Vegas strip, stay in a plush rental home overlooking the canyons of Lake Powell, and much more. We offer all of this within a Christ-centered, family friendly, God-awesome framework that emphasizes God's creation while connecting the dots that teach inspiring life lessons related to following Christ, overcoming obstacles, and becoming all that God designed you to be for His glory. Click the link below to check out some amazing pictures & our highlight video. Be warned though, once you see the link you won't be able to resist this trip! SLAMMED 2016 COMING THIS SUMMER! Join GTD this summer on the event that started it all 20 years ago! Be a part of our annual SLAMMED Adventure Trip! 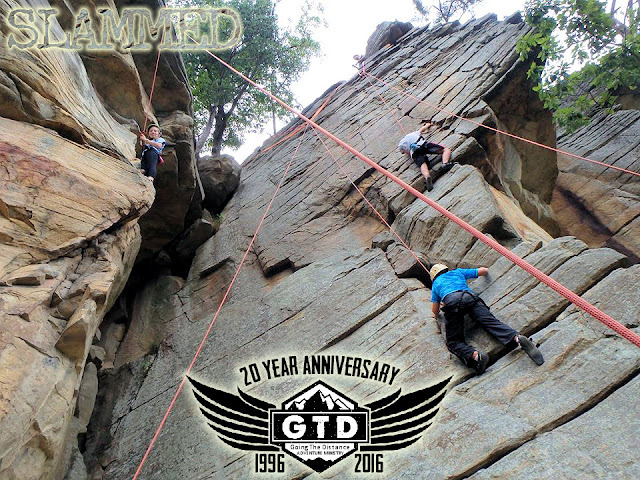 Let GTD slam you with a God-awesome adventure that includes rock climbing, rappelling, white water rafting, cliff jumping, bridge jumping, waterfall sliding, camping, and seeking God with a bunch of fUntastic people in the beautiful wilderness of eastern TN. GTD Turns 20 Years Old!! For me, it's actually a 25 year celebration that started way back in 1991. At the age of 21, I set out on a 17 day solo camping trip to seek God for direction in ministry. During his trip I spent a lot of time praying and reading the Bible, as well as reading several Christ-centered books. After weighing what I felt like God was compelling me to do combined with taking a personal inventory of my gifts, talents, passions, desires, and strengths (as well as my weaknesses, inabilities, and non-passions) the light bulb turned on. 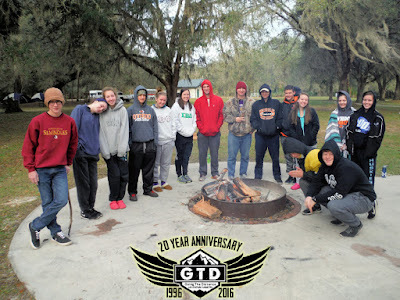 On a beautiful autumn day in November 1991 at Camel Lake in Apalachicola National Forest of the Florida panhandle, Going The Distance Adventure Ministry (GTD) was birthed as a passion in my heart. My desire and my calling was to combine Biblical life principles and adventurous activities into one ministry. It would take five years for GTD's first event to take place. 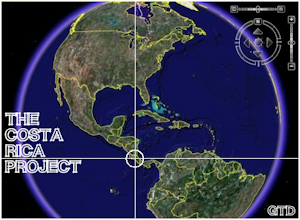 During the developmental years (1991-1995) the "blueprints" of this ministry were being drawn out. I noticed that far too many Christians were not experiencing spiritual maturity or fruitfulness. They lacked perseverance and solid Biblical wisdom. This influenced the naming of the ministry. Going The Distance Adventure Ministry captures the positive and exciting tone of the Christian message, conveys an attitude of Jesus-like perseverance, and leaves plenty of room for the ministry to grow and develop in whatever direction God leads. 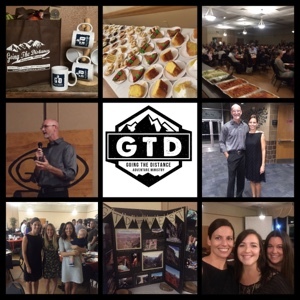 These early years of GTD were used for laying the firm foundation of a God-focused ministry. God used these years for the development of many of the plans GTD still uses today. And more importantly, God used these years to prepare me for the journey ahead and dependence upon Him. The years from 1991-1995 were spent on preparations, prayer, and personal growth. Then it all came together in 1996. GTD embarked on our first ever official Adventure Trip with over twenty college students from my home church - First Baptist Church of Indian Rocks. The trip was called, "How Much Can You Shove Into 4 Days!" (We now call this trip "SLAMMED"). It included an Atlanta Braves baseball game, Six Flags, Atlanta Fest, Stone Mountain laser light show, tour of Gatlinburg, white water rafting, rock climbing, rappelling, hiking, indoor skydiving, and bungee jumping! We shoved a lot into 4 days while seeking God first and setting a Christ-centered God-awesome focus. 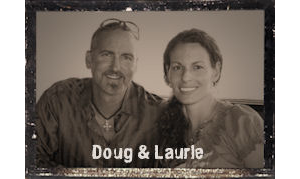 The trip was a great success and ushered in our brand of Christian-based adventure events. The years have flown by. It has never been an easy journey, but it has always been worth every ounce of blood, sweat, and tears. God has faithfully and consistently deepened our roots while expanding our programs. I have so much more to share and so many exciting events to reveal, but for right now I just want to thank everyone who played a role in the establishment, development, and growth of this ministry. I also want to thank 20 college students and 1 college Pastor who trusted me and signed-up for our first GTD event. There may not even be a GTD if they didn't come. Ministry is a team sport and GTD has lasted this long because so many wonderful and generous people answered God's call to get involved. I am humbled and overjoyed at the thought of the incredible people who have invested parts of their lives into this ministry. I praise God for each and everyone of you! As we reflect on the past we can't help but look forward to what God has in store for the future! 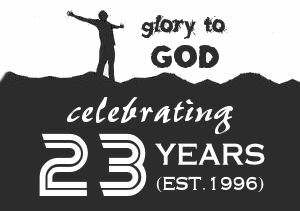 But NOW is the time to celebrate the accomplishment of 20 years of ministry! Thank You Jesus!! I've poured my heart and life into highly demanding adventures & administration for 20 years and I still have so much more left in my tank. My heart leaps for joy! 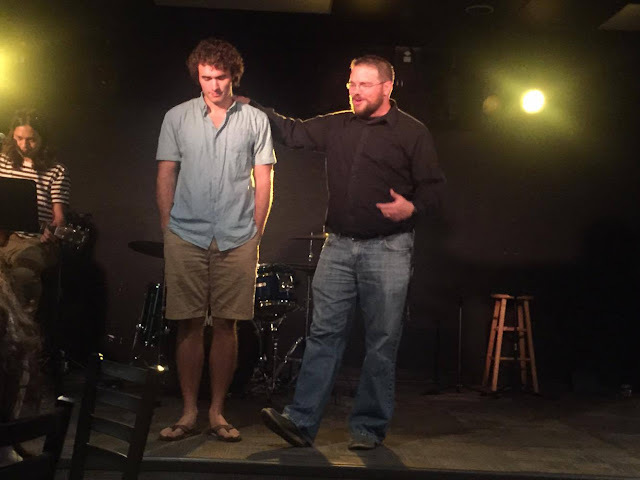 On January 10th, we wished our dear friend/summer intern Alex Powell well as he set out on a new adventure with YWAM (Youth With A Mission). Alex will be spending the next 3 months going through DTS (Discipleship Training School) in Honolulu, Hawaii before heading to Asia for 2 1/2 months of outreach. It has been such a joy working with Alex over the past year. We are excited to see him boldly step out in faith and into this next phase of life. We are confident God will use this time to grow Alex even more closer to Him and the call HE has upon his life. God bless you Alex, we love you and will miss you! Thank you for your heart to serve. Here is the letter Alex wrote to his family and friends in regards to is new adventure with YWAM (Youth With A Mission). In it he shares how he worked with GTD over the summer. Keep in mind after reading this, all of Alex's funds have been raised....P.J. (Praise Jesus)! Here is letter Alex wrote to his family and friends in regards to is new adventure with YWAM (Youth With A Mission). In it he shares how he worked with GTD over the summer. I have been accepted to Youth With A Mission Discipleship Training School in Honolulu, Hawaii. God is so good and He has made it clear to me that he has called me to go YWAM in this season of my life. I feel so blessed knowing this is where Jesus wants me and I am so excited for the opportunity to grow deeper in my relationship with Jesus and share His love with others. So here's a little background on how this all came to be. I was interning with an adventure ministry called Going the Distance for a couple months this past summer. During that time I was given the opportunity to share my testimony with the different groups, lead devotions in the morning, and share what God was showing me in scripture. I felt that God was putting it on my heart to attend a Christian College and pursue a degree in ministry. I shared this with a friend, the founder of the adventure ministry, Doug Garner as well as some other group leaders that attended the camp. They agreed and they encouraged me to pursue it. When I got back home from the summer I was given the opportunity by head football coach, Blake Engelhardt, to help coach football at Keswick Christian School. Back in high school, Blake was my bible teacher my junior year and I was his teacher's aide my senior year. When I rededicated my life back to the Lord my junior year Blake was there with me and was there to love on me, encourage me, and lead me in prayer. He has been a mentor in my life that I trust a lot. One day after practice he told me about YWAM and its two step format of discipleship training and then going out into the mission field. He told me how he thought this would be a perfect fit for me right now. After Blake told me about YWAM, I went home and excitedly researched it. Once I learned more about it I fell in love with what YWAM does. It was all I could think about for the next couple of days. I wasn’t sure at first if this was me being excited about it or God giving me a passion to do this. So I spent the next two weeks praying about it. I told my parents, close friends and my college pastor about it and they all thought this would be an amazing opportunity. I felt they were confirming what God was doing in me. I will be attending the winter session of Discipleship Training School (DTS) beginning on January 14, 2016 and will graduate June 19, 2016. DTS is divided into two phases. The first phase is the lecture phase which is 3 months of full time learning with some courses offering college credit. In this phase I will be going through times of lecture, worship, intercessory prayer, evangelism, daily personal quiet times, community outreach, etc. This intensive training will prepare me for what to expect and how to respond in the second phase, the outreach phase, which is about 2 ½ months. Outreach is a time when I can give myself to the needy, the desperate, the broken and the lost. It is my chance to see God use me in new ways and watch Him be faithful. I don’t know exactly what I will be doing but it could consist of trekking through villages preaching the gospel, teaching English, preaching in local churches, taking care of widows and orphans, praying for the sick to be healed, working on clean water projects or helping re-build a community after a natural disaster, to name a few. It's exciting because I do not know what country I will be serving in until just before I leave! I believe after this experience I will have a deeper understanding of the passions God has put on my heart, and what he has in store for my life. I am asking for your support both prayerfully and financially. I know this calling will not be possible without prayer. Financially I need to raise approximately $8,000.00 so I can be a part of this amazing opportunity. I truly appreciate any donation you are able to make. Please keep me in your prayers as I know I cannot move without the power of God and the help of His Church. 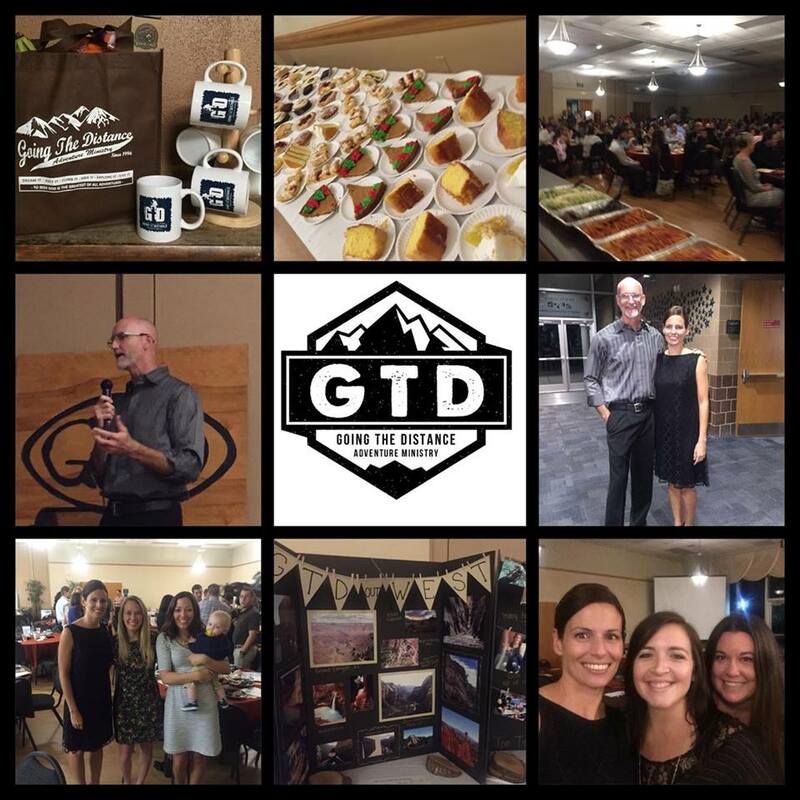 A special thank you to all our Table Sponsors from GTD's Annual Fundraising Banquet that took place this past November. 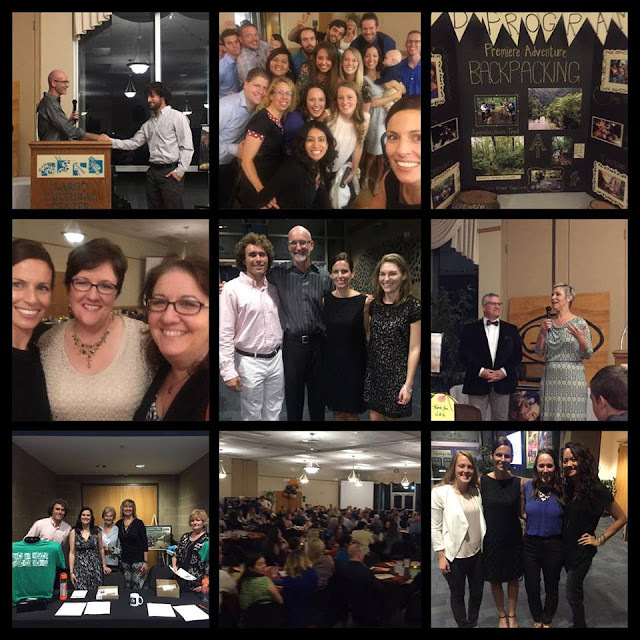 Each one of you helped to set a record for the most tables sponsored at one of our banquets and for funds raised! THANK YOU SO MUCH! Thank you to EVERYONE who made this night possible! We couldn't have done it without you! We are off to a strong start for 2016! For a non-profit organization the first and last month of each year are packed full of yearly planning, goal setting, immediate tasks, urgent deadlines, along with state and federal requirements. Long days and long hours are typically the name of the game. This year we are trying a new approach to work. 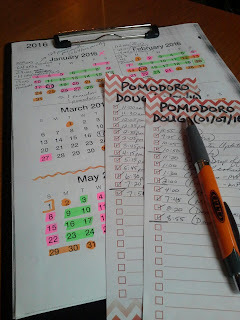 It's called The Pomodoro Approach and my friend Jim Butski (as well as Laurie) introduced me to it. it's designed to maximize effectiveness while minimizing work hours and potential burn out. It is a very simple, but brilliant approach to work. Basically you turn off everything that may interupt or distract you from FOCUSED WORK (cell phones, social media, even your fellow workers) for 25 minutes and throw yourself completely into ONE TASK. After 25 minutes of monomaniacal work you enter a checkmark on a sheet of paper and take a 5 minute break. That 30 minute time frame is considered 1 "Pomodoro". After 4 Pomodoros you take a 15 minute break. Many times the breaks actually feel like interruptions to the work that is being accomplished, but they actually allow the brain to have a quick recovery break and prevent burnout. It is sort of like how many athletes workout with interval training. They run hard for a few minutes and then take a quick "cool down" recovery break. Each Pomodoro actually feels like a 25 minute race to get as much done as possible... then you take a 5 minute break. After your 5 minute break, it's back to FOCUSED WORK... or if you have other responsibilities that you have to tend to then you may have to move on to meetings, phone calls, multitasking, etc. The theory is that we can get about 40 hours of work done in about 17 hours when we remove all distractions, throw ourselves "all-in" to one task at a time, accumulate a lot of satisfying check marks, and take quick recovery breaks. This is only our 5th day of using this approach to work, but the intial results have been extraordinary. I absolutely LOVE IT! I want to thank Jim for sending me the following link that spelled out The Pomodoro Approach and pass it on to you guys if it may help you be more productive at work. Have a great day! You can't walk on water if you stay sitting in the boat! Identify the walls and barriers that keep you from all that God designed you for... and make this your year for BIG leaps of faith to fully live out your calling for God’s honor & glory. 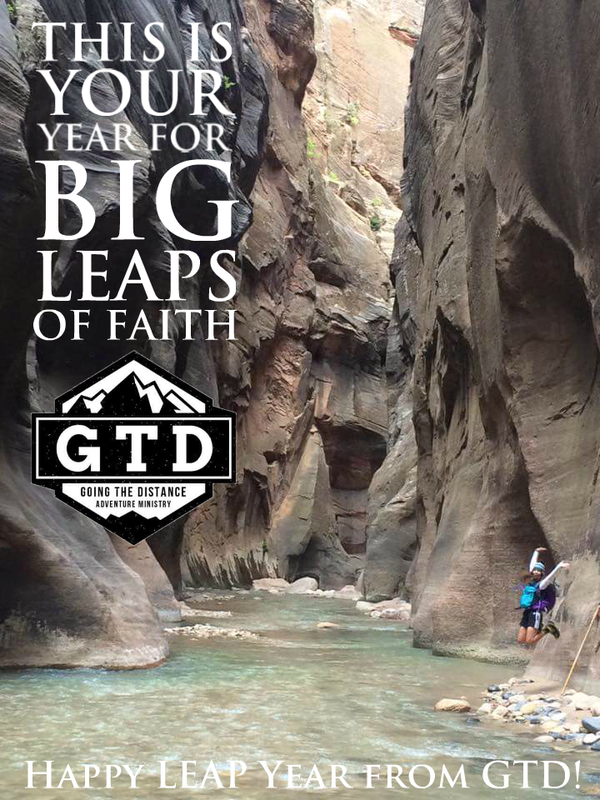 Happy New Year and Happy LEAP Year from GTD!! We dare you to make this one of the greatest years of your life by taking BIG LEAPS OF FAITH. Don't let fears keep you from great things anymore. Resolve to make this Leap Year the year you LEAP over the fears that try to limit your God-given potential. Make this the year that, like Peter, you LEAP out of the boat and right into the storm and start walking on water towards Jesus. You only have one life that you will live the rest of eternity reflecting on... that you one day have to stand before God and give an account of. Make this the year that you decide to stop being a spectator and start being a spectacular participant of the only autobiography that you will ever write. This is YOUR life story that you will live with for all of eternity. Why not find out what things are important to God and make them the most important things you live for... and then start taking daring and courageous LEAPS OF FAITH to live out your calling. LEAP over the hurdles of doubts and fears and self-defeating limitations and LEAP into a life of dangerous obedience of epically following Jesus. 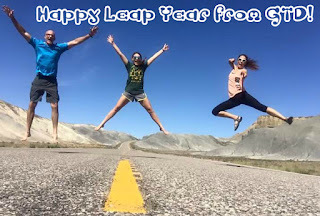 Make LEAP YEAR more than just one extra day on the calendar. Make it a daily reminder of the extraordinary LEAPS OF FAITH you're going to wilfully and intentionally take all year long to become all that God designed you to be. This isn't just another year! It's LEAP YEAR! And there is no better time to take BIG LEAPS OF FAITH for God than this year! We are right here with you. We can help guide you. It's what we do in GTD. It's what we've helped people do since 1996. We believe in you because God believes in you! Now let's get to some LEAPING!! "With You I can attack a barrier, and with my God I can LEAP over a wall." "Blessed are you when people hate you, when they exclude you and insult you and reject your name as evil, because of the Son of Man. Rejoice in that day and LEAP for joy, because great is your reward in heaven."